Microchip stocks are famous for their cyclical behavior due to supply and demand dynamics of the entire sector. As we all know, the market has experienced a correction in previous months and now it is in consolidation. Hence, the semiconductor industry represented by below ETF has reacted to the market with its swinging behavior. Companies are releasing their earnings at the moment. More importantly, the FANG stocks have just reported satisfactory or even better than that and thus, the other industries will follow if they can. Demand for semiconductors is still strong, several microchips (e.g. Intel) already reported their earnings. Hence, it is anticipated that entire industry is likely to swing up now. Xilinx designs and develops programmable devices, its related technologies, and services within integrated circuits segment. The company is based in San Jose, CA. The last reported earnings have beaten the estimates $0.75 to $0.65 and revenue grew by 3.6%. 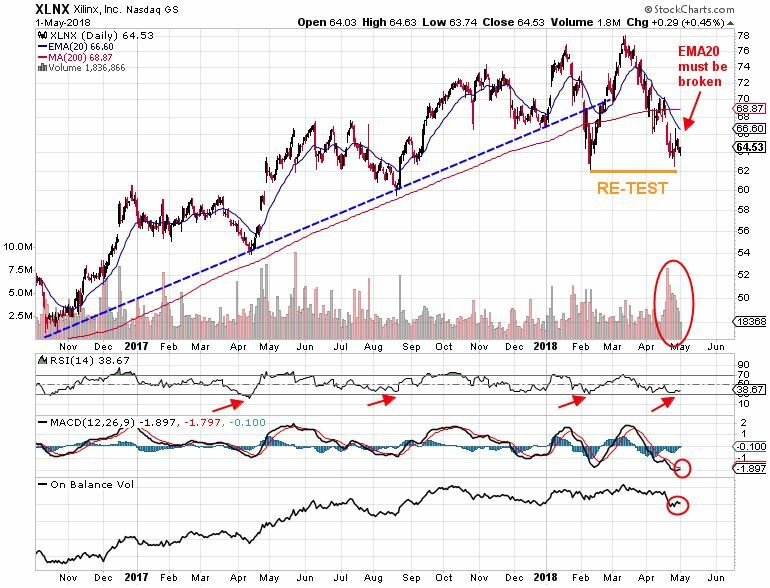 RSI – Every time the RSI entered this area, the stock price followed an increase. Now it is again sloping up. MACD – Not yet, but very likely the MACD line is going to cross the signal line. On Balance Volume – See the red circle below, slowly, but certainly, it’s sloping up. Volume – significantly increased during the last trading days after earnings release – an indication of a possible trend change. This is a time when price needs to be closely watched – when current resistance levels need to be watched. A breakthrough and staying above the 200 SMA would be considered as an entry point. The investors with higher risk appetite would take a long position when 20 EMA is broken. Everybody is now chasing FANG stocks because that’s what novice traders and majority of market participants do. Sooner or later, the institutional investors and experienced traders take their positions in semiconductors, where even bigger profits can be made. Xilinx signifies a great opportunity for both long-term and short-term investors. The stock applies well for swing trading strategy when its price might be driven to significantly higher levels. Important is to stay disciplined and focused on the big picture!